We live in the Fourth Industrial Revolution – an era with unprecedented technological advancement. This revolution has also come at a time with serious global ecological and social challenges. Thankfully, companies around the world are committing themselves to finding innovative, profitable solutions to these problems. Armed with the UN’s Sustainable Development Goals (SDGs), businesses from across the globe are leading the way to a more sustainable future. The SDGs are becoming a common language for describing sustainable market opportunities and corporate responsibility efforts. Many companies working towards the SDGs are not household names yet – but they deserve to be recognized for their efforts and incredible positive impacts. Consider companies such as Opus 12, Climeworks and Blue Planet, whose technologies capture CO2 emissions and transform them into usable materials such as petrochemicals, jet fuel and other useful products; or solar energy companies such as The Sun Exchange and Off-Grid Electric, which use technology to provide clean, reliable and affordable energy to those in need. The Global SDG Awards were recently launched to support this new era of leadership in sustainability and corporate responsibility. By driving private sector SDG engagement through competition, the organization hopes to create a race to the top and to inspire others with examples of sustainability leadership. Large companies are also demonstrating SDG leadership by using the framework to describe current and planned corporate responsibility efforts. In response to a 2015 video of a sea turtle with a straw lodged in its nose, Starbucks recently pledged to remove plastic straws from its stores by 2020. Similarly, McDonald’s is replacing plastic straws with paper ones in the UK and Ireland, and is considering alternatives for its stores in other parts of the world. These efforts directly support targets associated with SDG 14 – Life Under Water. Suppliers are also starting to respond to shifting consumer preferences. Tableware company Repurpose Inc. has seen a drastic increase in sales of their compostable straws since the beginning of the summer – driven by food service companies and consumers. Citibank recently became the first US bank with a commitment to closing the gender wage gap. Shipping giant FedEx recently became the first company to receive a perfect score on the Human Rights Campaign Foundation’s 2018 Corporate Equality Index, earning the title of Best Place to Work for LGBTQ Equality. Both companies’ commitment to gender equality in the workplaces strongly support SDG 5 – Gender Equality. Is your company a SDG leader? 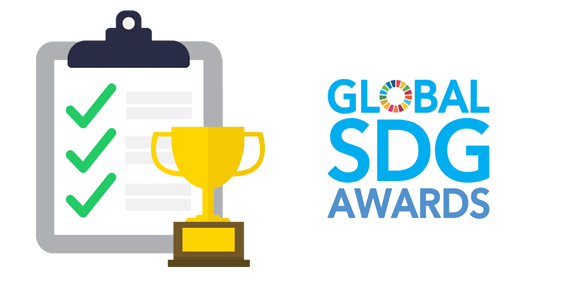 Companies from across countries and sectors can now compete for 17 annual Global SDG Awards. The awards will shine a spotlight on private sector solutions that are creating a better future for each and every one of us.